MOST SCARY MOMENT IN MINECRAFT! I landed exactly where I was standing in that screenshot. 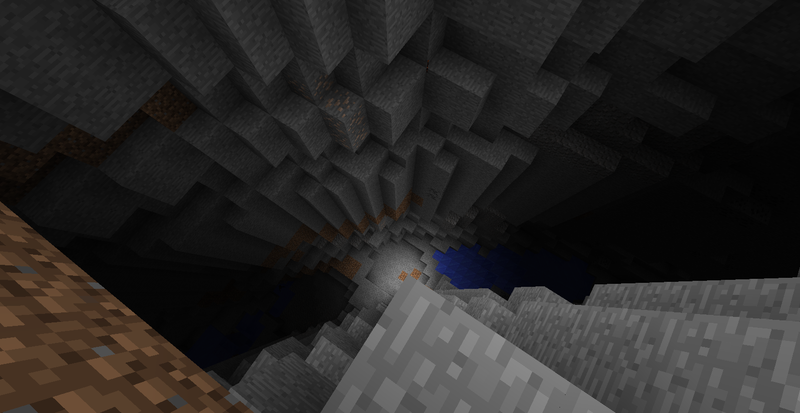 The creeper's explosion exposed a ravine that was just far enough underground to be completely hidden by a very thin layer of dirt, and I was less than one block from falling in. I was playing my Dossier survival world, and killing monsters in the desert at night, when it suddenly began thundering. I decided to go in for the night at my house near the plains village. When I woke up, I decided to get some Eyes of Ender from the villagers. As soon as I go up to the priest, I see this charged Creeper walking towards me. I tried to knock it back, but was too late - the creeper exploded. The blast killed half of the villager population, including a priest who was offering a Silk Touch enchantment. It also put a huge hole in the ground, destroyed two buildings, and knocked me down to three hearts.